Ernest Jones, having been established in 1949, may not be the oldest jeweller in Britain, but they have grown to be the largest jewellery retail chain in the UK. 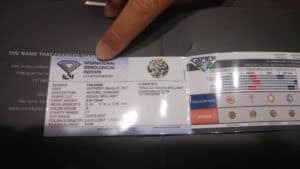 They are a subsidiary of Signet corporation, which is the largest diamond retail conglomerate in the US (spanning brand names there like Jared, Kay and Zales). Ernest Jones currently has almost 200 stores that gross over £200 million a year in revenue. To make sure our review was accurate, we visited stores in Edinburgh and Dublin (we wanted to make sure the pricing was similar). Both experiences were virtually identical, so we’ll just focus on the UK store for this article. Walking into an Ernest Jones store, you get exactly what you would expect from a mall store. The salespeople are not experts by any stretch of the imagination and the feeling is about as far from luxurious as you can get. We got the same sense of luxury and service that we got at the Nandos we stopped in for lunch after our jewellery shopping. Ernest Jones’ target consumer seems to be someone looking to spend under £3,000. There was very little in the way of decent diamonds in the stores. Just because someone is on a budget, however, doesn’t mean they should settle for poor quality. The best option they had was the Tolkowsky Cut. Before getting into the specifics of our experience, let’s talk about Ernest Jones’ pride and joy: their Tolkowsky Cut. Named after a famous diamond cutter who developed the modern day dimensions for an ideal cut diamond, this is a traditional round diamond supposedly cut to the strictest of proportions. If you’ve wandered around our site a bit, you will see that we agree with the theory that the optimum cut for brilliance is a traditional 57 cut round diamond (we are not fans of gimmick specialty cuts). We talk about this at length in various articles. Unfortunately the rhetoric doesn’t match the reality. Most diamond companies that focus on perfectly cut round diamonds offer stones with AGS certification. AGS certificates come with a highly sophisticated light performance graph that is considered to be head and shoulders above the competition. At the very least the diamond would have a GIA certificate (the gold standard for diamonds in general). Instead Ernest Jones went the cheap and easy route; they provide IGI certificates with a useless Gemex report. 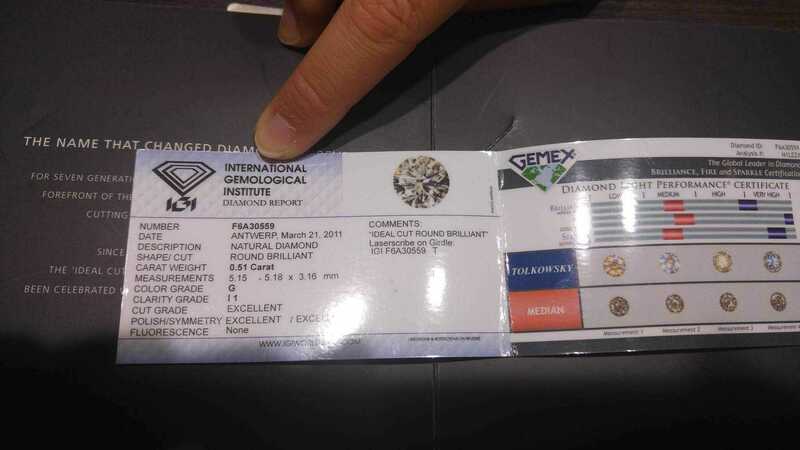 They don’t even provide a full IGI certificate that lists the actual specs of the diamond so you can figure out the cut for yourself. There is nothing about these diamonds to justify paying a premium. The cuts weren’t terrible, but they were not particularly brilliant. It’s easy for a consumer to look at them side by side with the terrible alternatives they have in the store and think that they are something special. But if they had a chance to compare one to a truly well cut diamond side by side, they’d see a much different picture. 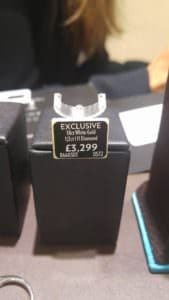 They showed us a 0.51ct G I1 in a 18kt white gold setting for £3,299. The inclusions were quite visible on the diamond (white streaks on the bottom towards the table and a grey inclusion right under the table). The cut was decent (we had to gauge it with our own eyes); the depth was fine and the table was on the low end with a high crown angle. It was brilliant but nothing spectacular. You might be wondering why the price tag on the right says “1/2 ct I I1” yet we were shown a 0.51ct G I1. This has to do with how the large retail chain jewellery stores operate. Unlike smaller shops that treat each diamond as an individual product, the large chains group their products into SKUs (Stock Keeping Unit). Without a SKU system, their inventory would become unbearably complex. What this means, essentially, is that the quality listed is a guaranteed minimum quality and size. In the UK, 1/2ct means 0.50ct or higher, but in the USA, this vague description can also include a 0.46ct stone. Since the suppliers of the large chains can’t physically supply the entire line in the exact minimum quality, there will always be free “upgrades” available – just like the G I1 that we were shown (a two color upgrade). Now back to the diamond we were shown — a diamond with such shortcomings should at least be a decent value purchase, right? Not in the slightest. Compare it to this diamond; a spectacularly cut 0.51ct E VS1 GIA certified excellent cut from Blue Nile for £1,322. Pair it with this comparable 14kt white gold solitaire setting and you are getting a far superior diamond (cut, color, and clarity) for less than half the price. Consider that most people who buy this SKU (and pay this price) are actually getting an I I1, and the difference in value is even more pronounced. This isn’t just about saving some dough, it’s about getting value for your hard earned money. The prices at Ernest Jones are inexcusably high and the quality is subpar. That is not the equation for a successful consumer experience. 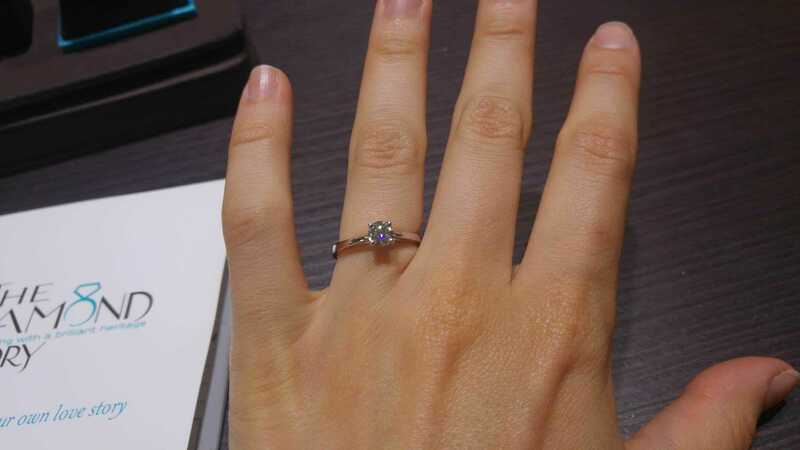 You can get a far better ring for a fraction of the cost going to Blue Nile (or other online retailer depending what you are looking for).